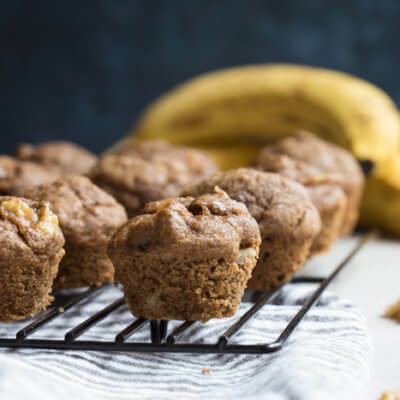 These Healthy Banana Bread Muffins with Walnuts are made with less sugar, whole wheat flour, and yes, that extra banana! We even subbed in maple syrup instead of white sugar into this recipe. Preheat oven to 350 degrees F. Prepare 24 count mini muffin tin with cooking spray or butter. In a large mixing bowl, whisk together bananas, egg, walnut oil, maple syrup and vanilla extract until combined. Add flour, baking powder, baking soda, salt and cinnamon to bowl and mix together just until combined taking care not to over mix. Spoon batter into muffin tins and bake in 350 degree F oven for 14-15 minutes, or until muffins spring back on the top and toothpick inserted into the muffins is done.